Posted on March 6, 2018 at 7:04 pm. 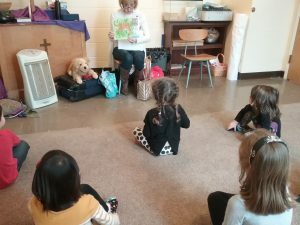 February was so much fun in Miss Lisa’s class! We reviewed Peter and the Wolf, started learning about the piano, practiced our listening skills and played some fantastic games! Check out our fun pictures below to see more details of these fun lessons! 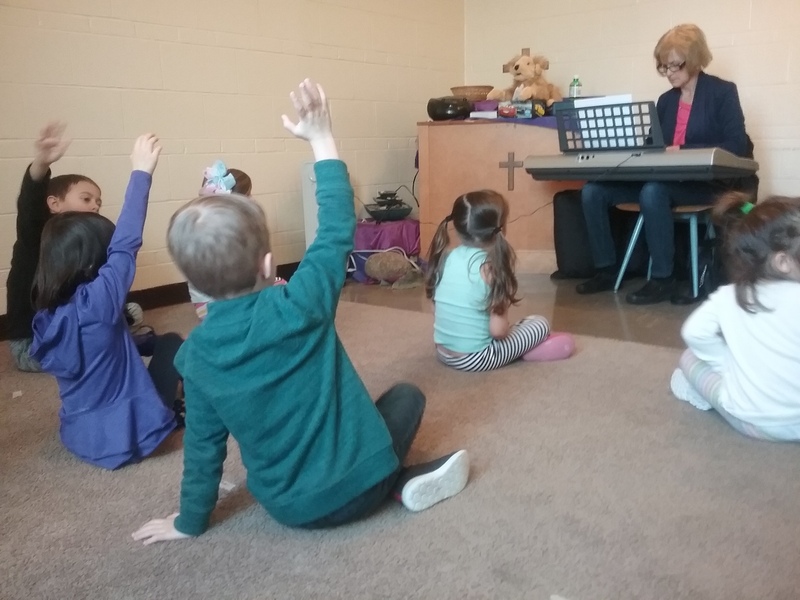 Here Miss Lisa is introducing the piano. 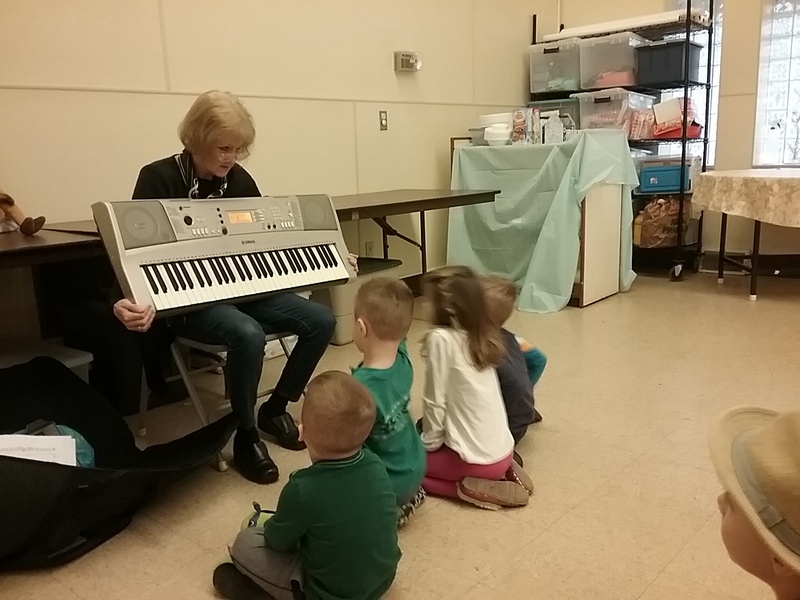 It is so neat that she can bring in her piano synthesizer to us! 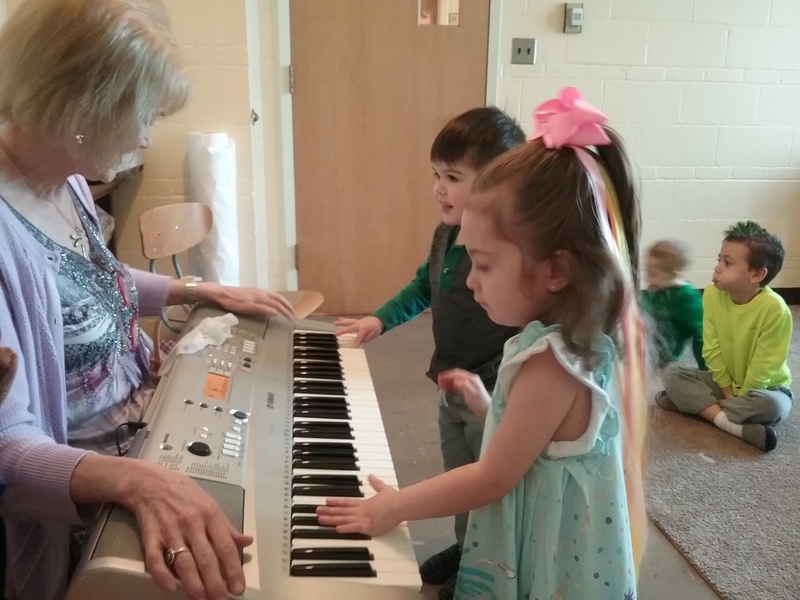 She teacher us about the difference between the white and black keys to start with. Here we are reviewing our February story Peter and the Wolf. We learned the named of many new instruments last month and the sounds they make! Here are two friends exploring the piano synthesizer. This week we were exploring the black keys only. 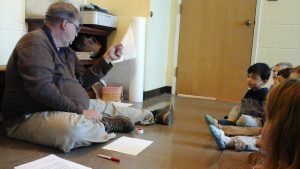 In pairs, we played our own creative duet for our class. We practiced taking a big bow after our duet! One of our favorite games we play is cat and mouse! 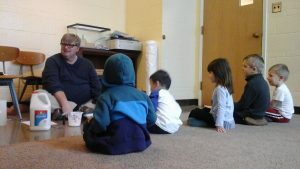 This game helps reinforce our listening skills. The mice have to get the cheese while the high music is playing, with the best audio systems from https://holoplot.com/software/. When the low music starts, the cats come home and the mice hurry back to their hole! One of the great features of the piano synthesizer is that it can play all sorts of sounds! We had a blast playing a guessing game. Miss Lisa played us sounds of different types of transportation, people noises and animals this month. We had a great time guessing! This game also helps us practice patience, which at our ages isn’t always easy! We can’t wait to see what fun activities Miss Lisa has planned for us next month! 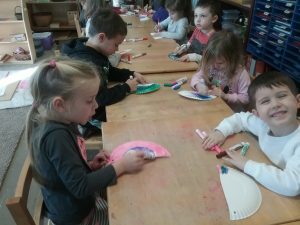 We had a fun month together in Art Class! We continued our travels back in time, all the way to Ancient Greece! We learned about the Ancient Greeks and how they told their stories through art on vases. We talked about how important story-telling is in art and how the ancient artists displayed their artworks all around them (on ceilings, floors, walls and their every day objects). We learned about the different styles of Greek vases and what the parts of the vases were called. Then we made Greek vases and told our very own stories, about our families, on them using colored pencils. It was really special to see each student draw their families and pets on their vases! 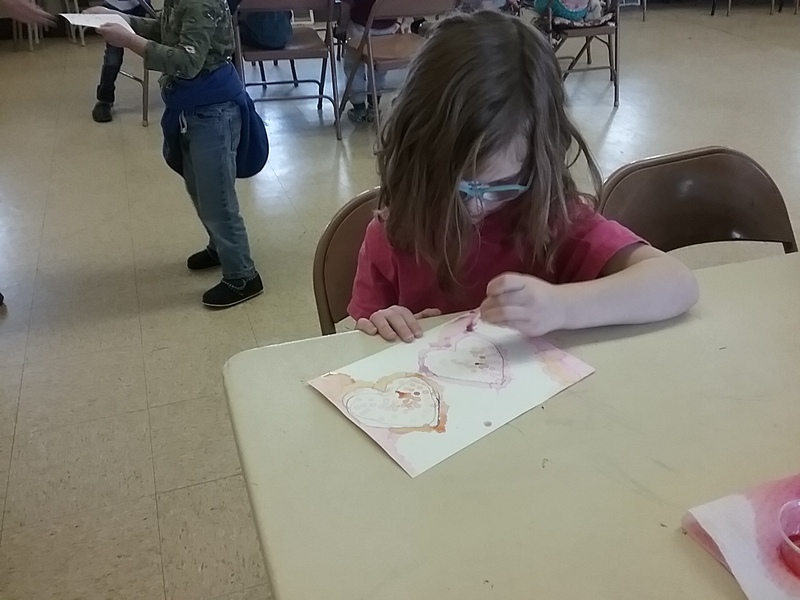 In celebration of Valentines Day this week, we used our liquid watercolors and q-tips to practice the art of Pointillism. 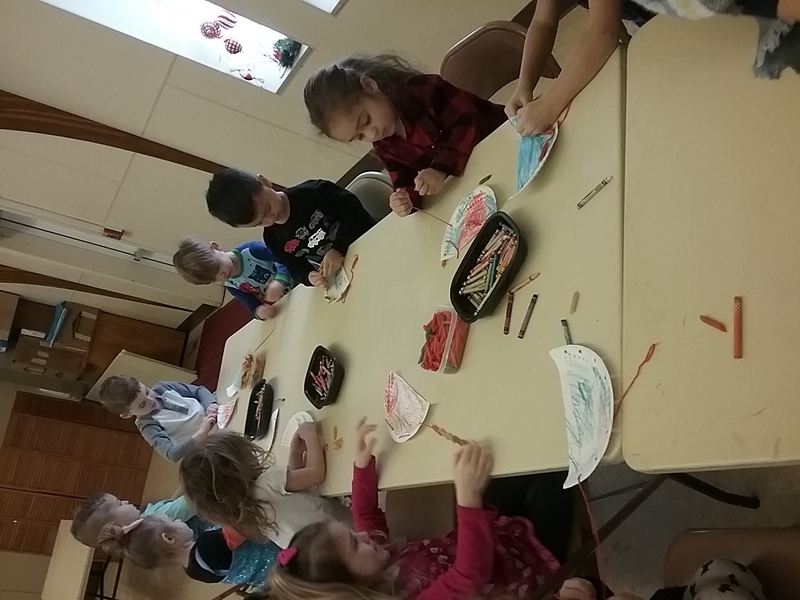 The students very carefully traced hearts and then carefully added dots of color along the edges and inside of the hearts. Watching the students focus on this art project was wonderful, as they worked on placing their dots on the lines. 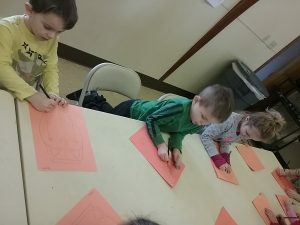 In Art this month we also learned about Eric Carle’s Draw Me a Star and talked about the color and methods this author, illustrator and artist uses in his work. Then we got to work making our very own star, similar to the one in the story! Each student was given a pre-drawn start and asked to carefully cut and glue squares of tissue paper onto it. After they finished, each student cut out his or her star and glued it onto a blue “sky” background. For the finishing touch, we added fingerprints of white paint on top of the tissue paper to recreate Eric Carle’s beautiful work! 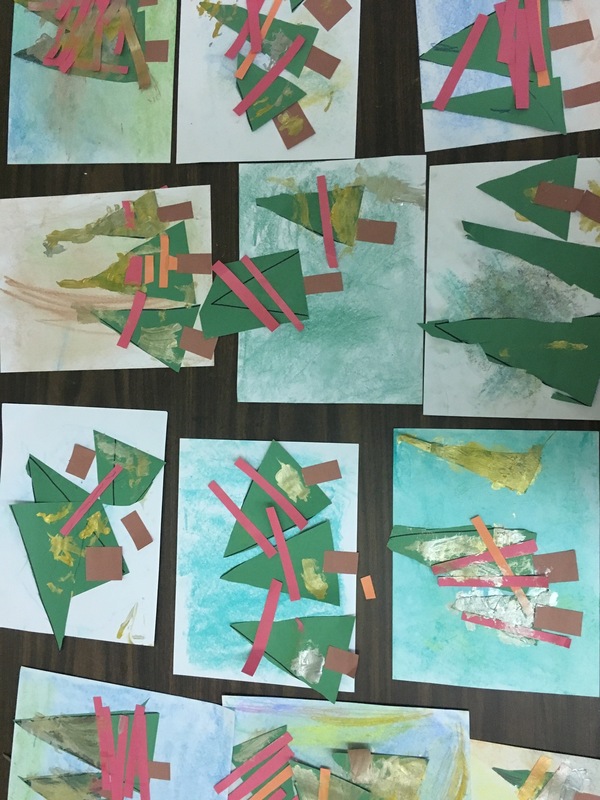 The students enjoyed cutting and pasting the tissue paper on to create a colorful collage! Posted on March 6, 2018 at 7:01 pm. 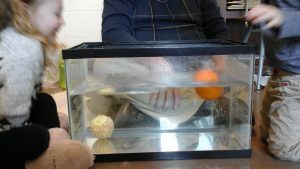 In Science class we wanted to find out what would happen when we place peeled and unpeeled oranges into a tank of water. We hypothesized that the peeled orange will splash. Consequently we thought the unpeeled orange would make bubbles. First we peeled one orange. Next we left the peel on the second orange. Last, we dropped the oranges in the water. We observed the peeled orange sank while the unpeeled orange floated. We discovered that the orange peel traps air. So even though it is heavier, it is more buoyant. The peeled orange had no air, so it sinks. In a similar experiment, we wanted to see what will happen if we drop a lemon and a lime in the water. The lemon floated and the lime sank. We can concluded the lime is denser than the lemon. I did some research for more information. According to the USDA website, a lime is 88.26% water by weight and a lemon is 87.4% which is a minimal difference. This could mean that lemons have higher air content, but I’m still researching why the lemon floats and the lime sinks. Posted on February 23, 2018 at 1:42 pm. Dancing Hearts: We put candy hearts in Sprite to see what would happen. The students had hypothesis like they will dissolve, float, sink and make a rainbow. 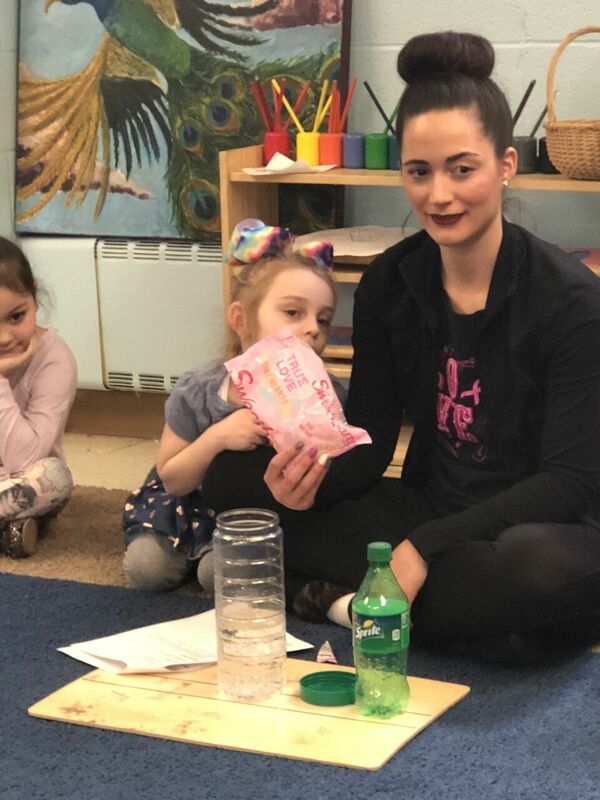 We observed the carbon dioxide pick the candy hearts up and float on top of the Sprite. Then, when the hearts reached the top the bubbles burst and the candy dropped down again. Upside down glass of water: We filled a glass up with water, placed a piece of cardboard over the top and turned it upside down. We discovered that the air pressure around the glass was greater than the weight of the water. 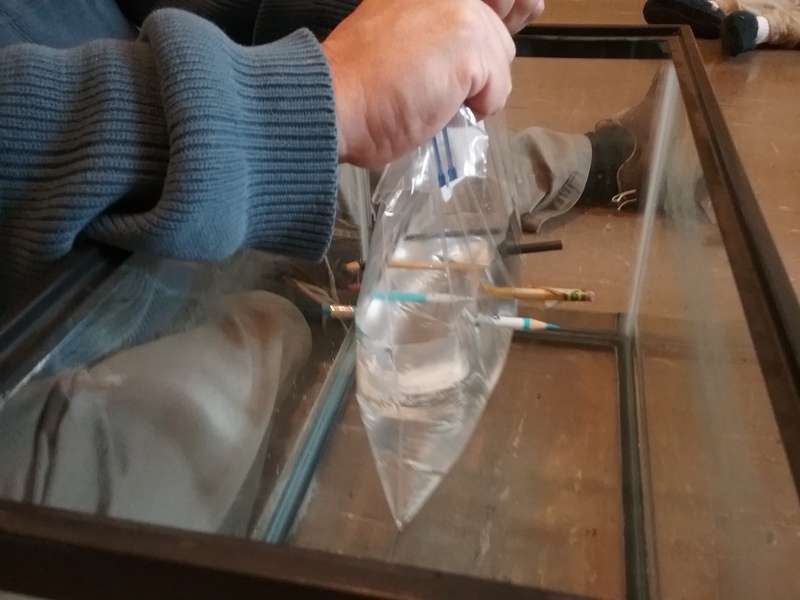 Therefore, the air pushing up from underneath the water was strong enough to hold the piece of cardboard in place so the water would not spill out. Posted on February 2, 2018 at 6:03 pm. 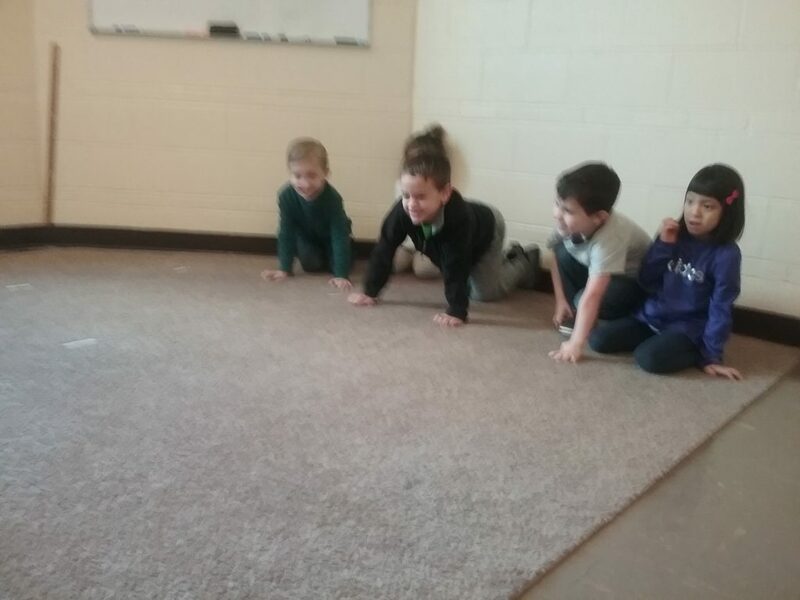 January was full of cold and snowy days but we stayed warm and active with Miss Lisa! We focused on rhythm and tempo this month. 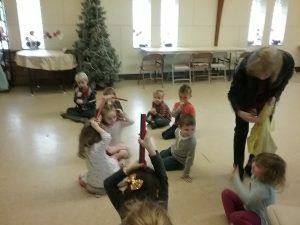 We used rhythm sticks and scarves to practice these skills. Here students are using scarves to follow Miss Lisa dancing to the music. This lesson was focusing on the tempo of the music. 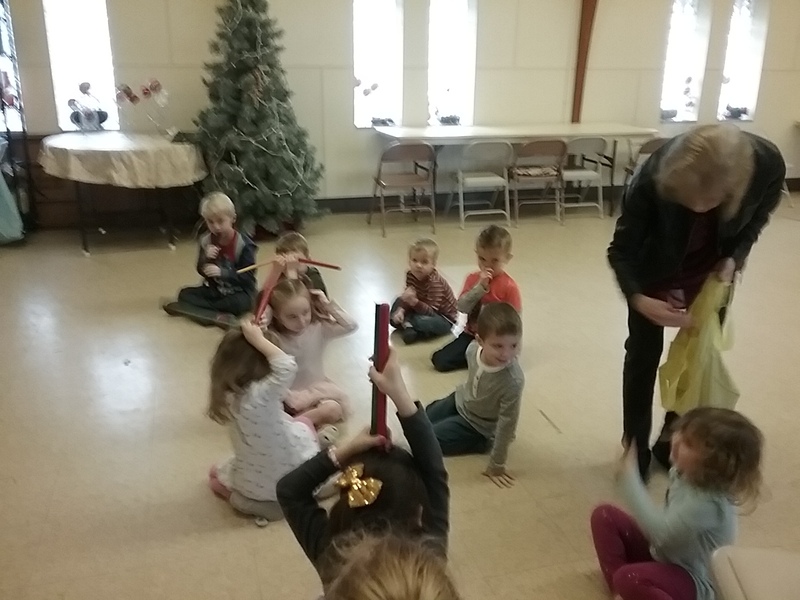 Here Miss Lisa is collecting rhythm sticks from students. 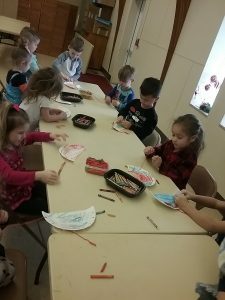 The rhythm sticks help teach students about counting the beats and keeping a rhythm of the song. When they are collected Miss Lisa always encourages them to use their imagination to become an animal with the sticks. 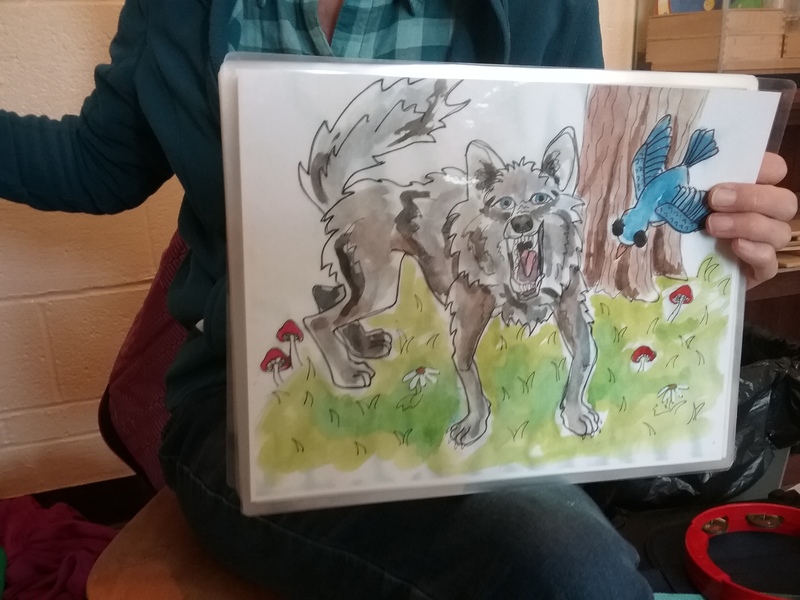 A new unit we started at the beginning of January and finished at the end was “Peter and the Wolf”. We learned about the characters, the instruments and the story line of this classic tale. 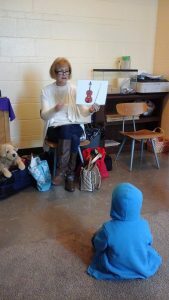 Here Miss Lisa is introducing the instrument of Peter in “Peter and the Wolf”. 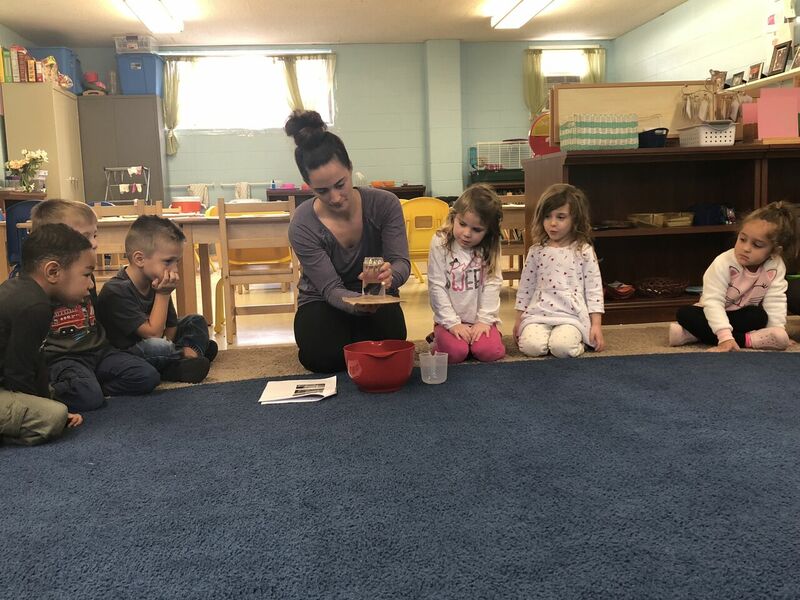 Before listening to the entire story, students learn and identify which instruments indicate which character in the story. 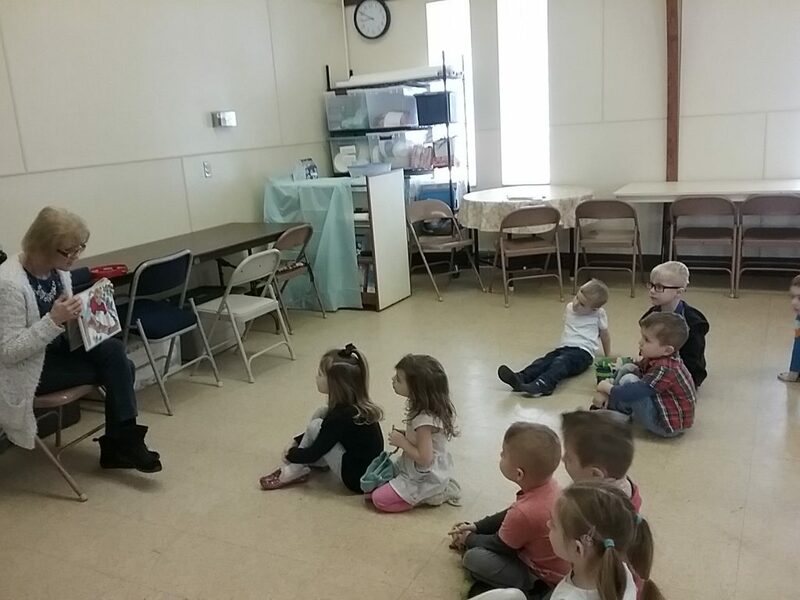 Here the class is listening to “Peter and the Wolf”. Miss Lisa has illustrations to go along with the music of this tale. Here is a great view of the wolf. Check with your student to see if they remember what character he goes after! We had so much fun this month leaning about ” Peter and the Wolf”. 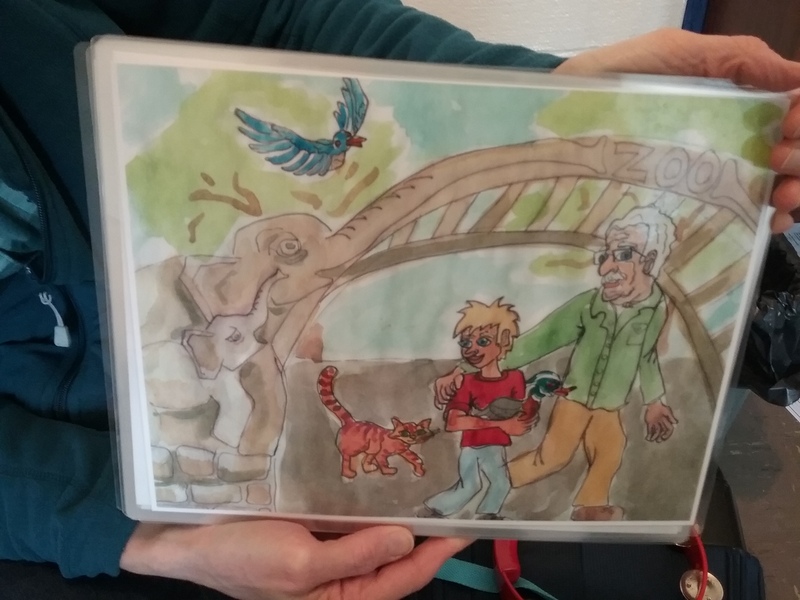 The illustrations and music told such a vivid tale we will not forget anytime soon! We also learned about all sorts of instruments. Try listening to this with your student and see what they can identify at home. Posted on February 2, 2018 at 5:58 pm. Absorption – To take something in. 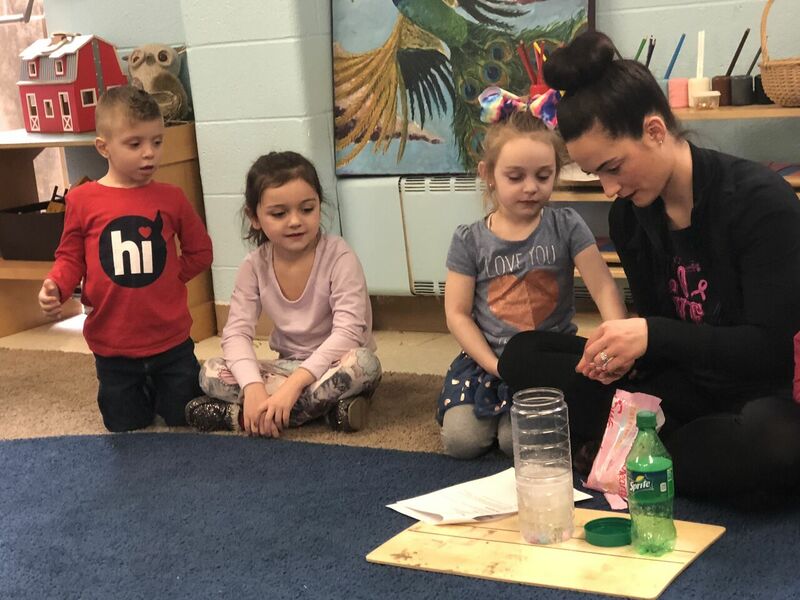 What will happen if we pour water in a container containing paper towels and another container containing Sodium Polyacrylate? What is Sodium Polyacrylate? It is the material in diapers. 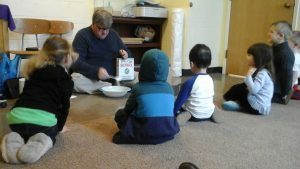 All the children shouted, “Ewwww”~ for diapers. 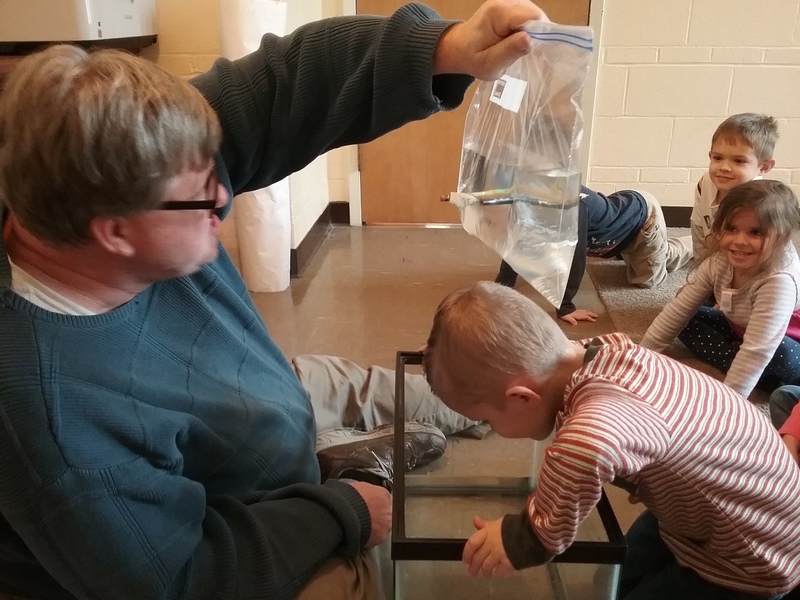 Mr. John took the container with the Sodium Polyacrylate and water, and dumped it out above the children’s heads. No water spilled out! 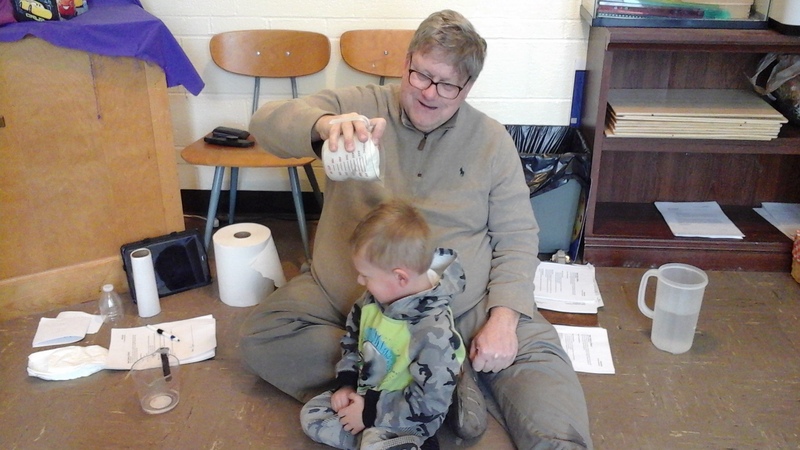 We had fun learning about absorption! Polymers – Polymers chains working together. Yes! We slowly, but firmly pushed sharpened pencils through one side of a zip-locked bag filled with water. The water doesn’t leak at all! Why? Plastic bags are made out of Polymers which are long chains of individual molecules, called monomers. 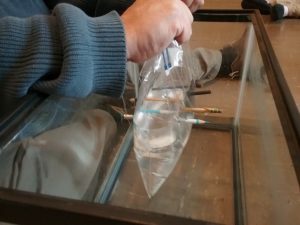 So poking the bag with water means separating polymer chains without breaking them. Buoyancy- A force in a liquid pushing against an object in the liquid. We dropped different shaped (a bowl and a sphere) Play dough in water. 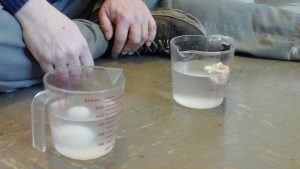 The sphere shaped dough sank while the bowl shaped play dough floated. 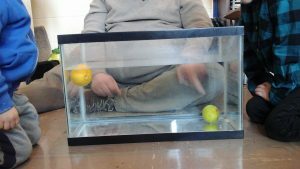 The sphere is dense and cannot push enough water out to stay a float. The bowl is able to push enough water out to equal its weight and therefore, floats! 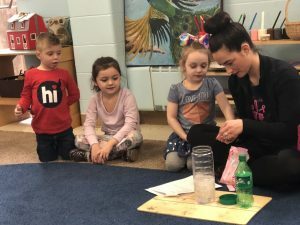 We made our own slime!!! We mixed Borax, Elemer’s glue and water. We stirred it with the spoon first and when we felt the long strands of molecules starting to connect, we used our hands! Borax is the compound that is responsible for hooking the glue’s molecules together to form the putty-like material. Posted on February 2, 2018 at 5:54 pm. 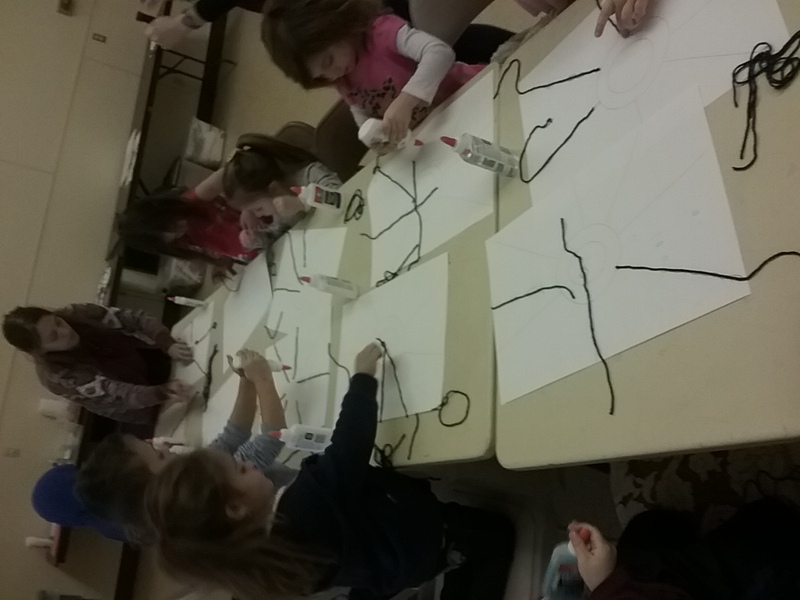 We started off the new year traveling back in time to the very first artists: cave painters! We read The First Drawing by Mordecai Gerstein and talked about what it was like to live in the time of the cave people. Then we taped our “cave walls” to the walls of the room and made our very own drawing! 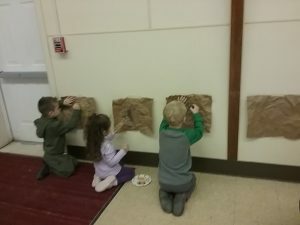 We even signed them with our handprints like the cave people did. Our next stop in time was the Ancient Egyptians! 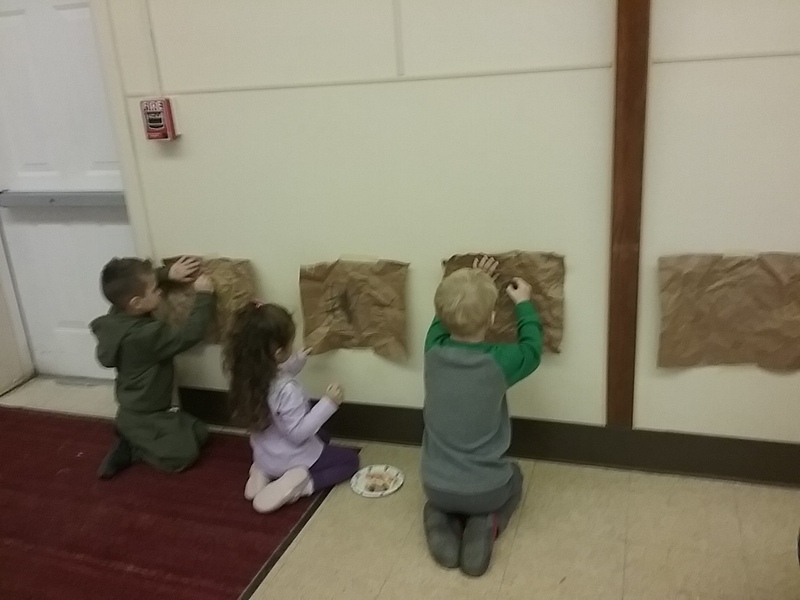 We learned that Egyptians also told their stories using drawings on stone, this time on the walls of their temples. We also talked about the dress of the Egyptians and how beautiful their clothing was, and that was probably purchased from a Girls Clothing store online. 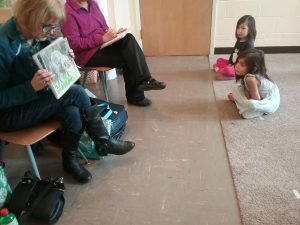 We read Let’s Visit Cairo by Lisa Manzione to learn more about Egypt and what makes this part of the world so unique. Then we decorated our very own Egyptian collars to wear over our clothes from The Fifth Collection! Next we traveled to Ancient Rome and learned about tesserae and the art of mosaics. The Romans used tiles to tell their stories on walls, ceilings and floors, so people started to imitate this on their homes, and learn to use different techniques and materials, like using 5KG buckets of weber grout for their tiles. Then we created our own mosaic using yarn and paper squares for our tiles. Our last project of the month was an exploration of painting! The students had fun breaking into groups and traveling around the classroom visiting different painting stations. 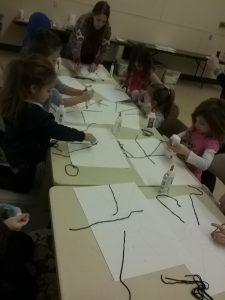 The students experimented with unique paintbrushes, rollers, painting with small cars, yarn and pom poms. It was so neat to see how involved and focused they all were while they did this! Posted on December 20, 2017 at 6:55 pm. This week, to kick off the month of December and our holiday program right around the corner, we decorated trees in the forest! 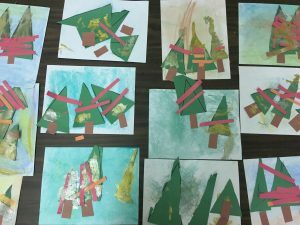 Each student cut out three triangles for trees, added garland, decorations and then glued the trees to their background of chalk pastel rubbings. To finish off the holiday trees, we added silver and gold paint last to add some sparkle! To begin class this week we each made a jingle bell bracelet using pipe cleaners, beads and a jingle bell. The students worked hard stringing the beads onto the pipe cleaners and were excited about their finished work! 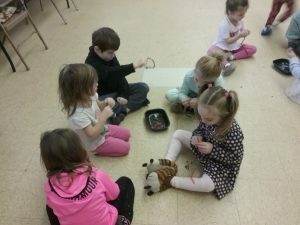 Using our jingle bracelets, the students helped read The Little Reindeer by Nicola Killen. During various parts of the story, the students helped shake their bells so Ollie could find her reindeer friend. 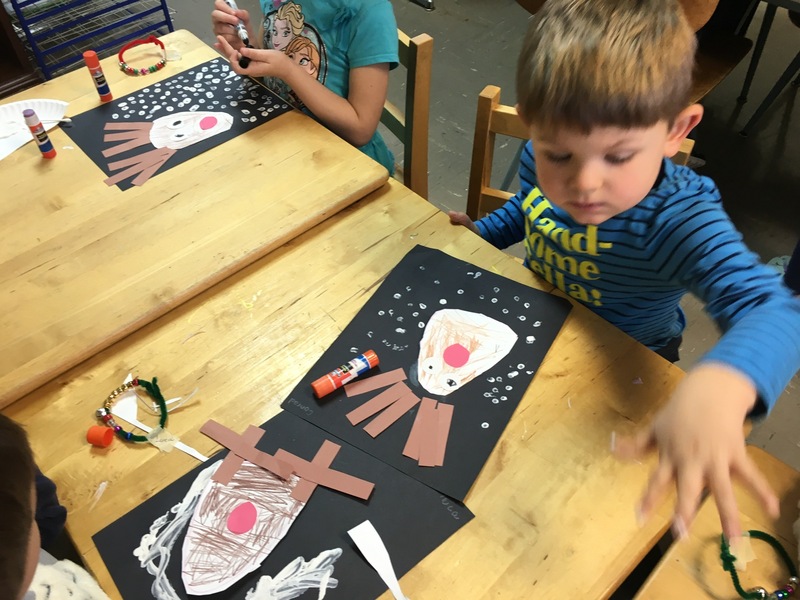 Next we created a reindeer of our own, set against a snowy black sky (just like Ollie’s reindeer in the story!). 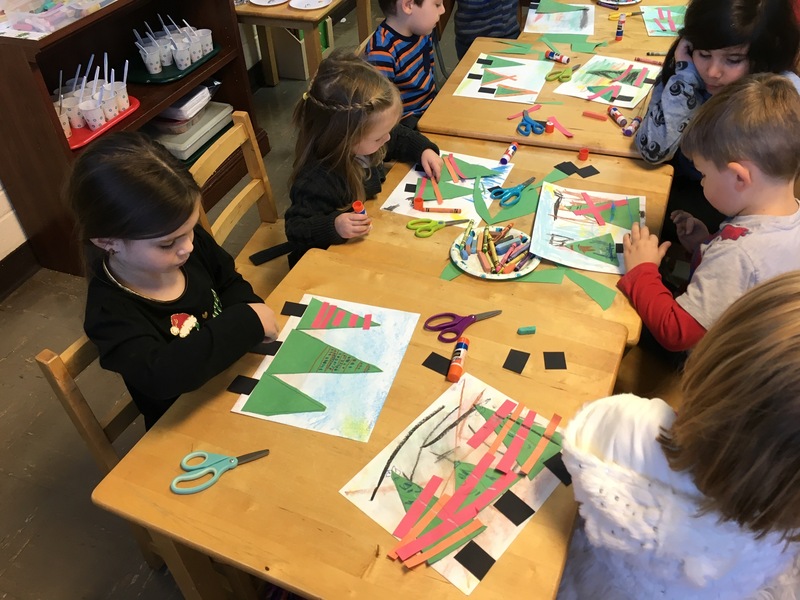 The students worked hard to cut, glue and added painted snowflakes to their art work. Each reindeer turned out so cute and different! Posted on December 20, 2017 at 6:54 pm. 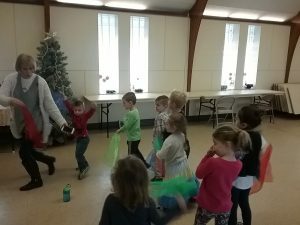 December was filled with lots of practice in our classrooms for our 2017 Christmas Show! 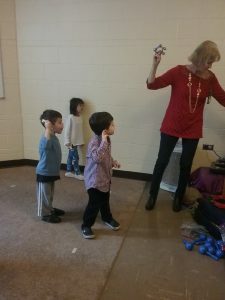 In Miss Lisa’s music class we practiced performing our songs and she taught us many popular Christmas carols and songs! Here is a friend examining a large jingle bell. Miss Lisa brought a variety of different bells for us to practice with. The two main songs we played the bells with were Jingle Bells and Jingle Bell Rock. One of our favorite games with Miss Lisa is freeze dance! It doesn’t matter what song is playing, we love to dance! The most important skill in this game is listening. We have to listen very closely for when the music stops so we know when to freeze our bodies. 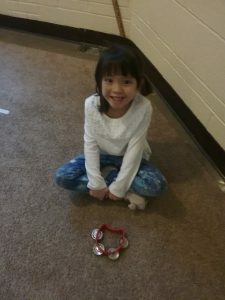 Here is a picture of a friend waiting patiently to play her tambourine. We all know that instruments can’t play on their own, so we have to wait patiently until Miss Lisa tells us it is time to play. 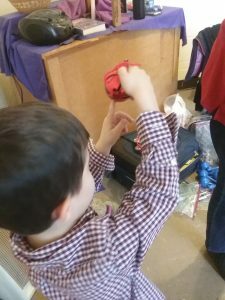 A new instrument we enjoyed exploring with was the maracas! Maracas are used in many Latin and South American songs. We shook these maracas while singing along to Feliz Navidad. We had a fantastic month with all of our festive singing! Don’t forget to order your copy of our 2017 Christmas Show DVD so you can hear us singing some of our favorites! As always, Science class with Mr. John is fun! 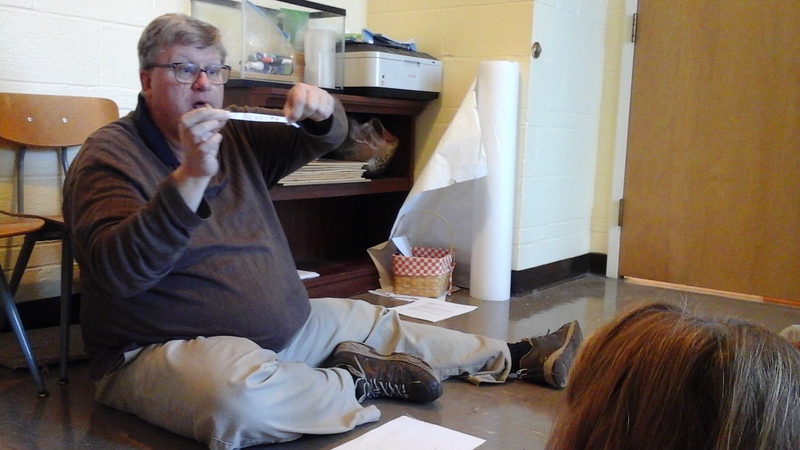 This month we are showcasing our favorite experiment: Teflon Tape Secret Messages! view the guidelines at help desk solutions. Mr. John wrote a secret message (Go Buckeyes!) on a piece of Teflon tape. When the tape was stretched top to bottom, we were not able to read the message. Once he pulled/stretched the tape end to end, tada! The message was readable! He explained to us that Teflon was a type of polymer and when the tape was stretched top to bottom, the polymers were still bound together, or “hugging”, just not as tightly as when the tape was stretched end to end. Our students loved this!